If you're looking for a economical homestead tractor, you might consider one of the earliest of ttte utility-type tractors, the Allis-Chalmers Model B. This machine could be the workhorse tractor of today's homestead. Rated at 20 horsepower, the B is considered a single-plow tractor, but depending upon soil types and conditions, it is capable of putting a double plow. While the B is a farm tractor in size, its power, workability, and durability make it superior to any of today's largest garden tractors, and its price, §150 and up, is a far cry from any other farm tractor or new 20-horse garden tractor. A wide variety of attachments were produced for this versatile little tractor—mowers, cultivators, single-bottom mounted plows, and a rather unique two-way plow designed to allow plowing while traveling back and forth on the same furrow. Don't limit yourself to mounted accessories. The B can easily pull a variety of manure spreaders, trailers, discs, drags, and planters. The power take-off will handle balers, blowers, rakes, and, best of all, the belt pulley will power feed grinders, saws, and small threshing machines, which are so handy in homestead and small farming operations. Some of these tractors are equipped with a small hydraulic system capable of handling mounted plows, cultivators, and other assorted lightweight implements. For the most part, snow blades and manure buckets are homemade and thus of a wide variety. Sutton on his old Chalmers B. The B was introduced in 1937 as a lightweight general-purpose tractor; it is precisely this age factor which makes the B a very attractive tractor for the homesteader. Because of its age, the B often sells for less than §300 at farm auctions and between §300 and §500 through tractor dealers. Even here in Wisconsin, where these tractors are highly prized by tobacco farmers, the prices remain low. Also, because of their age. they are simple machines and are economical to operate. I prefer the hand start model, because of the simplicity of the mechanical workings of the tractor. The only concern with a hand start is the potential kickback of the cranking handle. Any indication of a backfire or kickback is a sign that it is time for maintenance. At any rate, if you hold the crank properly (that is, with your thumb on the same side of the handle as your fingers), at most the Hying handle may kick back and sting your hand, but there will be no broken bones. 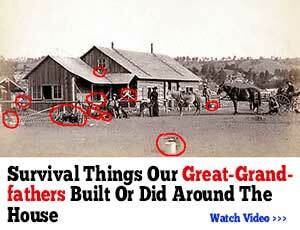 Can you really homestead with the old Chalmers B? Absolutely! I have heard of people farming up to 80 acres with one B and a few attachments. My father-in-law farmed 280 acres, including up to 21 acres of tobacco, with a couple of Bs, an old Chalmers WC, and a good team—and with one of the Bs running the milking machines for 40 to 45 Jersey cows. My wife, son, and 1 recently raised two organic acres of tobacco with our oldest B (hand start) doing all of the disking (no plowing) and all other soil preparations, planting, cultivating, and harvesting. And the old B could have handled more acres had we the lime and fortitude. Farts for all models are still readily available and inexpensive if purchased wisely.